The total dollar volume of real estate sales in June, 2015, tipped the billion mark at $1,018,625,166, according to the Multiple Listing Service (MLS) report released by the Austin Board of REALTORS® (ABOR) this morning. But that's not all... The number of homes sold in June totaled 3,051, breaking the 3,000 mark for the first time since July, 2013. Additionally, mid-year stats indicate Austin-area home sales increased four percent year-over-year, putting 2015 on course to exceed 2014's historical high in sales volume. The median price for Austin-area single family homes bumped up to $272,250, according to the report, an eight percent year-over-year increase. 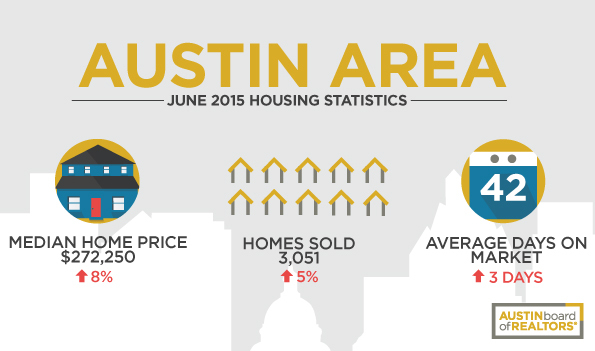 Less than three in 10 single family homes sold were priced below $200,000 in the Austin area. Average days on market for homes hovered at 50, three days longer than the same time last year. New listings increased to 3,812 for June, up three percent, but inventory remained at 2.8 months, well below the 6.5 months the Real Estate Center at Texas A&M University stipulates as a “balanced” market for home sales. “If this growth continues, 2015 could become another historical year for Austin-area home sales. Both home buyers and sellers can expect a strong, competitive market for the rest of the summer selling season,' Cooper concluded. I hope this real estate market update for the greater Round Rock and Austin areas has been helpful. If you know anyone who needs my caring, competent help as a real estate professional, please tell me who I can assist. Email or call [(512) 694-9469] me anytime. I will take excellent care of anyone you send my way.